When I got my new night/resting splints last week, I was surprised at just how similar they look to the ones that I wear during the day, well, in my opinion at least. I didn’t know what to expect from these ones. I’ve had a type of night splints before but I was told that they would be different to those, so it was a bit like watching somebody unwrapping a present when they got taken out of the bag at my appointment. the resting/night ones are white, while I chose to have black ones during the day. The night time ones also have more padding all along the inside, but you can’t tell that from the pictures , I don’t think, because it’s the same colour as the splint itself. I think they are a slightly different shape around the foot. When I tried them on at the appointment I was surprised at how comfy they seemed. For a while, I spent some time just wearing them in sitting so that I could get used to how they felt before I decided to try them overnight, which I did last night. I still can’t quite get them on myself, so my mum helped me out before I went to sleep. It took me a little bit of time to get comfortable, but once I did, I don’t think they disturbed my shut eye. I think that wearing these splints in bed might take a bit of getting used to, but hopefully it won’t take too long. I managed to keep them on for a few hours before I needed to get up in the middle of the night. At this point I had to take them off again because they don’t have any grips on the bottom for walking in. I can take them off by myself, but I haven’t found a way to be able to get them on yet so I’ll have to experiment to try find one. 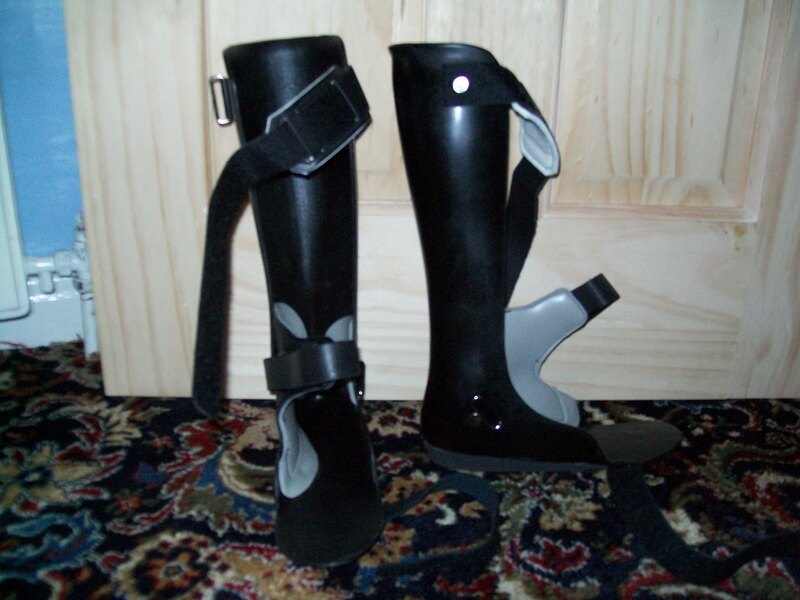 My day splints don’t have grips on either, but I wear these with shoes because they are for during the day when I’m moving around. 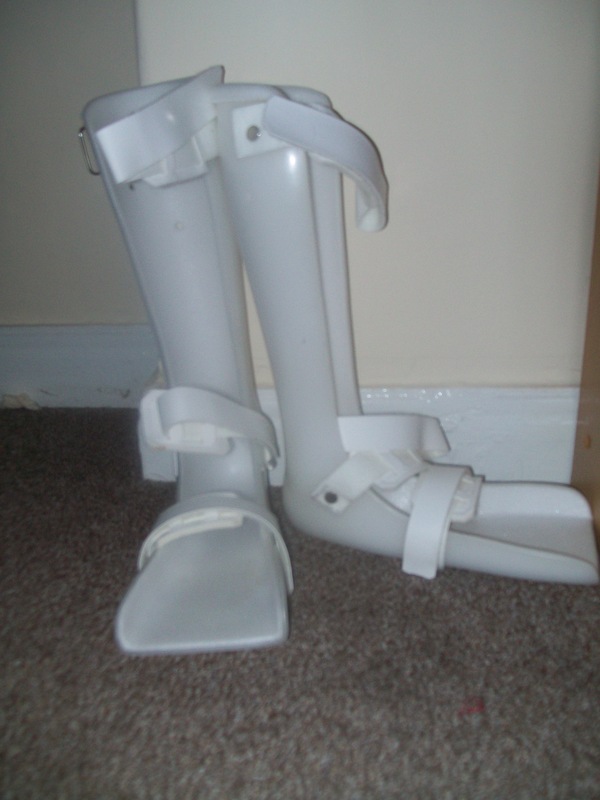 The night splints are to wear at bedtime, or for periods when I’m going to be sat resting rather than moving. Hopefully, I’ll manage to put these on by myself soon, but until then I didn’t fancy waking anyone else up to help me with them again because I think it was about 2am at this point, and I don’t think anyone would’ve been best pleased with me. In the end, I decided to keep them off for the rest of the night because my feet were starting to feel like they getting to the point where they’d had enough for one day anyway. When I did remove them, I could tell that’d I’d had been wearing them though, in a good way. I guess I’ll just have to get into the habit of taking a glass of water to bed with me until I can manage to put them on for myself. I’m going to try and spent a couple of hours sat in them today while I’m at the computer or something to make up for the time that I didn’t have them on. The padding really helps in them makes them so comfy! I have had my day splints padded underneath the foot to make them comfier for longer, as I spend a lot of time on my feet, and standing on hard plastic gets a bit uncomfortable after a few hours. I like night splints because you can get a really good stretch without any effort… When I get my left night splint I’m going to wear it with a leg gaiter to get an extra stretch on both my calf and hamstrings, I also prefer sleeping like that as it keeps my legs where I want them and stops them spasming and pulling into uncomfortable positions. I know what you mean about the day splints. Mine aren’t padded underneath the foot so it’s always nice to take them off at the end of a long day. Sleeping in night splints and gaiters sounds pretty intense to me, but if it works and makes you more comfortable at night I guess it must be worth it. I remember when I wore leg gaiters it took me ages to get used to them but I haven’t worn them for a long time.